Vinyl and heat-applied graphics on-demand. Satisfy customers quickly, easily, profitably. 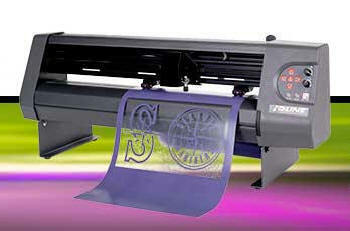 Create heat-transfer designs and vinyl decals, signs, banners and vehicle graphics. The compact 100 System cuts a variety of roll-fed media, with excellent tracking accuracy. The Ioline 100 System features the SmarTrac® tracking system and a more powerful servo motor than other brands to ensure accurate tracking and continual operation. The 100 System cuts roll-fed materials as small as 7 inches on up to a full 25 inches in width. First introduced in 1998, Ioline's SmarTrac™ technology set a new performance benchmark in the industry. Specially engineered parallel-pin driveshaft with a proprietary tread pattern provides a powerful grip on all types of media. If you're in the business of team uniforms or other twill products, we suggest you check out Ioline's flatbed appliqué cutters. The 300 and 350HF Systems are designed for volume twill cutting and include 301 Software for creating sew disks. There's no easier way to do sports letters and appliqué. Learn more about the 300 System and the high-force 350HF System. Cut media as thin as paper to materials as dense as sandblast mask. The SmarTrac I/S and the contour-cutting SmarTrac SC are offered in a variety of cut widths, starting at 25 inches (63 cm) and ranging up to a full 6 feet (182 cm). Built in the U.S.A. with durable metal parts, SmarTrac sign cutters set an unparalleled standard for reliability. Learn more about the SmarTrac I/S and the SmarTrac SC cutters. There's relatively little to maintain on the 100 System, however extended use without ANY service or preventative maintenance will over time have an effect on the results of the machine. Internal belts can become loose or worn, ajustments can drift off specification and will show as poor cut quality on occasion. Always ensure that the Ioline 100 plotter is maintained correctly by authorised technicians periodically. Preventative maintenance is always lower cost overall than a big repair due to lack of maintenance in the first place. Lubrication: No oiling or grease required. Simply wipe dust and lint off the machine periodically. Blades: Use an air gun to remove lint build-up around the blade. For more indepth information please check 100 Series Systems or contact Ioline Europe or call 01782 544700 for more information.